Feeling itchy? How do you know if you have lice? You've likely arrived at this page because you are wondering if you have lice, if your child has lice, or if someone you know has lice. So how do you know? If you have lice, you may see one or all of these different lifecycles of lice which include nits, nymphs, and adult lice. The most common way to identify lice is by seeing lice eggs or nits. Usually seen at the nape of the neck, behind the ears, or near the hairline above the forehead, eggs will be attached to the hair shaft. Approximately the size of a pinhead, they usually appear white on black, dark brown, or medium brown hair. In lighter hair colors they can be harder to detect because they often appear to be the same color as the hair. Eggs are attached to one side of a hair strand and have a distinct egg shape. Unlike dandruff, it is not possible for a nit to be flicked off with a finger. To removed an egg you will literally have to pull it off. If you are able to remove the egg from the hair place it against something white, like a paper towel. Eggs will not look white when put against a paper towel. They will be a shade of brown. The next life stage of lice are called nymphs which are baby lice. These are lice that have recently hatched from their eggs. Like eggs, nymphs are also about the size of a pin head and are also a shade of brown. Like adult lice, they have six legs and are wingless. Unlike fleas they can only crawl, not jump. Adult like are brown to grayish tan colored with large abdomens and six legs. About the size of a house ant, they do not have wings and typically move extremely quickly through the hair. They cannot fly or jump. Lice feed off of human blood and produce an enzyme that prevents blood from clotting. 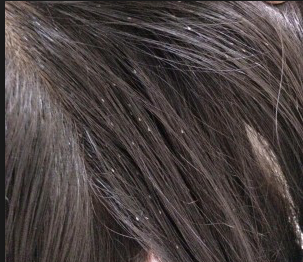 Reaction to this enzyme is what causes the itching associated with lice. Some people have an intense itching reaction, while others may not feel anything at all. All people of any hair type and age can get lice. They do not prefer clean over dirty hair or vice versa. They are happy to live in straight hair, African American hair, hair that has been color treated, etc. It is more likely for people who have a lot of close personal contact with others to get lice. Children and teenagers in school, college students in dorms, and teachers and daycare providers are at a higher risk of contracting lice. However, it is possible for anyone to get lice. Still not sure? Schedule a professional screening!